America has been infiltrated at the highest levels, with even former Central Intelligence Agency Director John Brennan reported to have converted to radical Wahhabism during his time working the Saudi Arabia station. It's not a surprise to most Americans that under the guidance of Director Brennan, the CIA was utterly incompetent when it came to crushing what President Barack Hussein Obama himself described as a "JV squad," but with the ascendance of President Donald Trump, a man who does not yield to radical Wahhabism, the Islamic State JV squad has shattered into a thousand pieces, reduced to a shadow of its former self. Despite the progress made against the most existential threat facing the United States, ie the rise of radical Islam, one man is working overtime to undo the progress and once again plunge parts of the Middle East into the Dark Ages: Robert Mueller. Since being handpicked by the Deep State and with personal approval of former Director Brennan himself, Mr. Mueller has worked tirelessly to undermine the will of the American people by fabricating allegations against our Commander in Chief. Sources close to Director Brennan allege that Mr. Mueller has been spotted praying to Mecca along with other high ranking members of President Obama's intelligence community, indicating that he has converted to Islam and may no longer share the same beliefs as the majority of freedom-loving Americans. 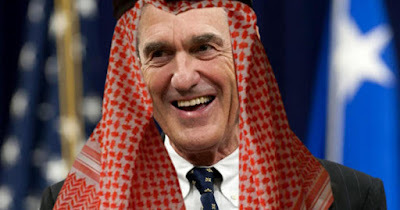 According to reports, Mr. Mueller -- or Mullah Mueller as he's referred to in whispers by people aware of his association with Wahhabism -- sees President Trump as the biggest threat to the continued expansion of militant Islam throughout the world, and is seeking to undermine him even if it means plunging the United States into civil war. Make it no mistake about it, the Deep State is desperate and its agents are affiliated with radical Islam and they are agitated seeing their Islamic State project collapsing; we may see a false flag attack carried out by globalist agents of Saudi or Yemeni background that plunges the United States into the biggest conflict it has seen since World War II.